P.Z. Myers says,"Christianity Has Been on the Wrong Side of History..."
Well known (read "infamous") atheist P.Z. Myers, with the usual venomous hyperbole of the Cultural Marxist milieu, posted an article on his blog titled Evangelical Christianity: A Movement Built on Hypocrisy by the Worst People in the Country. I bet you can't guess what he thinks of Christians. "Samantha Bee gives a history lesson, and as always, evangelical Christianity has been on the wrong side of history, and for the worst reasons, and under the leadership of some of the most awful, terrible, horrible people." "It’s also telling that they have so consistently rejected the people who espouse positive Christian values (like Carter) to support scum (like Reagan). At least nowadays they’re reduced to choosing between scum (Cruz) and scum (Trump), and they still favor the least Christian, and most bigoted choice." "Mr. Carter’s recent accusations of Israeli war crimes, his demand for a United Nations investigation into Israel’s actions in Gaza, and his call for Hamas – a genocidal terror organization – to be recognized as a legitimate political partner by Israel is making it near impossible not to ascribe to Carter some nasty feelings toward the Jewish state." So let me get this straight; Myers wants us to know that Carter, who thinks a terrorist organization like Hamas is trustworthy and should be legitimized, and who is an anti-semite, is a better Christian than Ronald Reagan. You can't make this stuff up, folks. The facts of history the ever sarcastic Myers ignores are that between the years 1917 and 2007, 148 million people died as a direct result of pogroms prosecuted by avowed atheist leaders and their regimes. Alfred Kinsey- who exploited children in his sexuality research. Napoleon Bonaparte- His rule resulted in the loss of six million lives, the French territories, and the bankruptcy of France. Than Shwe- Atheist dictator of Burma. His regime enforces child soldiers, governmental press control, the imprisonment of opposition, and forced labor. Kim Jong Il- The quite dangerous Communist dictator. Benito Mussolini- The once Fascist dictator of Italy. 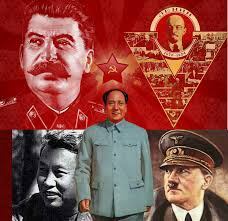 Mao Zedong- Responsible for up to 67 million deaths of his own people. Pol Pot- Former leader of the Khmer Rouge, and dictator of Cambodia between 1976-1979. The combined results of his regime's policies and persecution resulted in the deaths of over 2 million Cambodians, approximately one third of their population. My suggestion to P.Z. Myers would be to tread lightly when pointing the finger at Christians or conservatives, considering the truly objective "scum" who share the title "atheist" with him are obvious stains on human history. By way of demonstrating the absurdities that P.Z. Myers promotes, he appears in this video claiming humans are fish. Yep. Fish.